Slemish Mountain on the outskirts of Broughshane is an all year round photographic location especially at dusk when the last moments of the light meanders its way across the relatively flat landscape below. 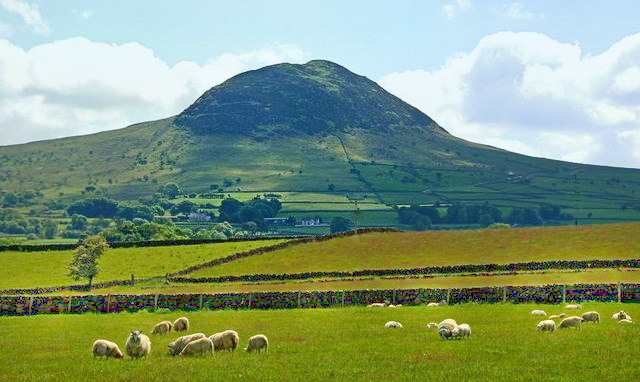 Legend has it that St Patrick used to tend his sheep on the slopes of this mountain, and it is still a place of pilgrimage in memory of him on St Patrick's Day (17th March) today. It is the largest of a number of volcanic plugs dotted around this part of Co. Antrim. Getting there: From Ballymena take the A42 out to Broughshane. Turn right onto the B94 and Slemish mountain is signposted from here. Access: Car Park with picnic area and public toilets at base of mountain.